This annual article updates readers on the most important developments in international arbitration in Australia in the past year. It surveys legislative, case law and other developments since 1 September 2013. This article will discuss some real life case examples of what will be termed “lawyers behaving badly” where it will be argued that legal representatives have not performed as effectively as they could have in mediation settings. These instances of “lawyer misbehaviour” will be grouped under several broad headings: the Process Thwarter, the Zealous Adversarial Advocate, the Misguided Advisor, the Distributive Bargainer, the Passive Advocate, and the Legal Takeover. Reflecting on these situations will provide guidance to legal educators as to the specific areas of dispute resolution knowledge and skills that future lawyers need to learn and develop. This article details a recent research project in which 21 experienced mediators were interviewed about access to justice in mediation within the civil justice system. Interviewees were presented with hypothetical mediation scenarios, and were asked to identify potential practical and ethical problems in relation to procedural fairness, and parties’ ability to access information and advice. The interviews revealed that a thorough intake process, and ensuring all parties have good access to legal advice and information, are crucial to ensuring a fair mediation process. In most mediation courses, “culture” has not been adequately considered. In fact, culture has only recently been incorporated into mediation training, often as an afterthought. The complexity and multidimensional aspects of culture have resulted in the topic been largely neglected in mediation training, process design, and intervention. However, the demographic changes of Australia as a nation that embraces multiculturalism and diversity has made culture an aspect of dispute resolution that deserves full attention. The provision under cl 3(3)(a) of the National Mediator Accreditation Standards specifically directs that mediation be conducted in a linguistically and culturally diverse community when appropriate. This article examines the state of cross-cultural mediation in Australia, and what can be done to further the uptake of mediation in culturally diverse communities. 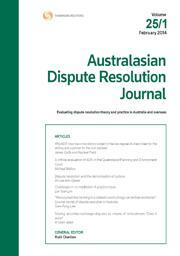 In this article, the unsuitability of the current mediation models that are premised on the concept of mediator neutrality for Australian Indigenous communities is discussed. It differentiates between concepts of neutrality and impartiality and suggests that the latter holds more importance within Indigenous communities. Using knowledge collected from an urban Indigenous community, it explores the receptiveness of the “elder co-mediation model”, which is premised on the concept of impartiality, as a preferred model of dispute resolution within that community. While questioning the concept of mediator neutrality, this article also explores the therapeutic jurisprudence of mediation models, specifically the transformative mediation model, and introduces the paradigm of “sustained dialogue” as a conflict management model within Indigenous communities. It concludes that within Indigenous communities, attention should first be directed to conflict management and then to dispute resolution. For the pdf version of the table of contents, click here: WAU – ADRJ Vol 25 Pt 4 contents.